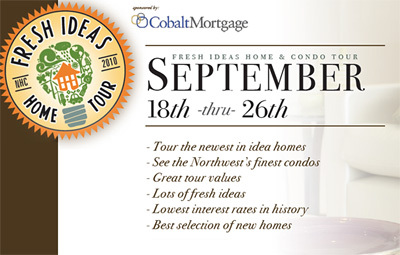 The New Home Council is hosting the 2010 Fresh Ideas Home and Condo Tour, which runs from September 18th through September 26th. The tour features 84 new(ish) home and condo developments throughout the Puget Sound region, which includes a great mix of single family dwellings, condos and townhomes. The tour, essentially, is a self-guided promotional event hosted by the region’s home builders. In respects to condos, with few exceptions, most of the condo developments on the tour have been completed for a couple of years now. If you’re in the market for a single family house, though, there are many new developments to choose from. There are a couple of giveaways including a chance to win a $1,000 gift certificate from Greenbaum’s Home Furnishings and $10,000 from ENERGY STAR Homes (entries are available at participating ENERGY STAR homes). I believe the only one within Seattle is The Decatur Condominium on First Hill.